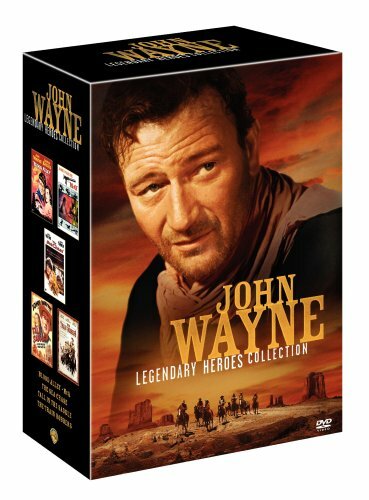 The John Wayne Legendary Heroes Collection features five classic films from the larger-than-life American hero, including Blood Alley, McQ, The Sea Chase, Tall in the Saddle and The Train Robbers, all available on DVD for the first time. McQ (1974) - John Wayne forcefully enforces the law in this high-velocity thriller that's a revenge western set in the big city. Police Lieutenant Lon McQ (Wayne) investigates the killing of his best friend and uncovers corrupt elements of the police department dealing in confiscated drugs. Directed by John Sturges (Ice Station Zebra, The Magnificent Seven), McQ also stars Eddie Albert (Roman Holiday) and Colleen Dewhurst (Annie Hall, Dying Young). The Sea Chase (1955) -John Wayne and Lana Turner are a formidable romantic team in this harrowing adventure directed by Academy Award-nominee John Farrow (Wake Island). Sea captain Kal Erhlich (Wayne) is an anti-Nazi German freighter captain at the outset of World War II attempting to sail his ship from Australia to the North Sea rather than risk internment. Both Allied and German ships follow in pursuit, while Erhlich battles storms, sharks, and romances. Tall in the Saddle (1944) - In this fast-paced entertaining western, John Wayne stars as Rocklin, a cowboy who upon arriving at a ranch to work as a cowhand finds his employer was just murdered. Although he has no friends, and no money, Rocklin stays in town, intent on tracking the killers and uncovering a plan to inherit the dead employer's riches.